November 28 2014. On November 16th, on the banks of the Potomac on an unseasonably chill day, runners were watching the cold made visible by their breath and thinking of the miles to come. Except for the trick of getting from the end of warm up to the start of the race, it was a good day for running. Overall and M40. 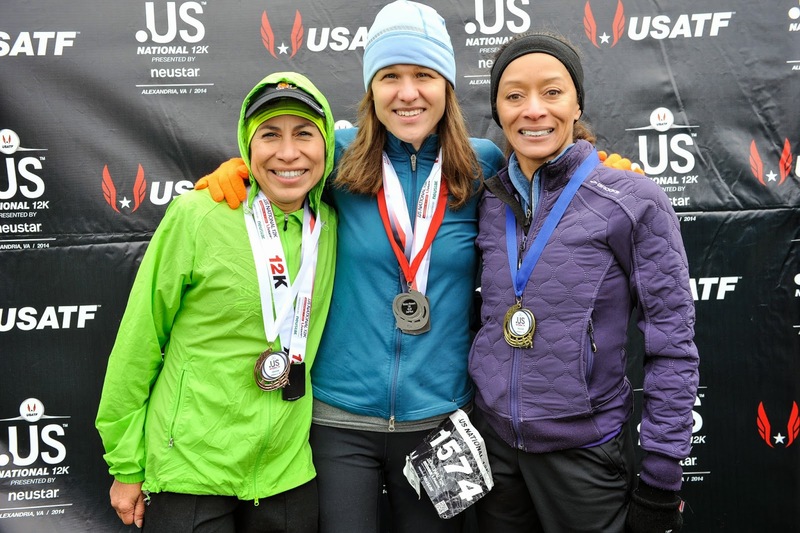 Top 40-44 year old runners on the USATF circuit had other appointments to keep on this day. That in no way phased local heroes, Michael Wardian and Philippe Rolly, who surged to the front of the Master's pack, passing the 1 mile mark in 5:06. 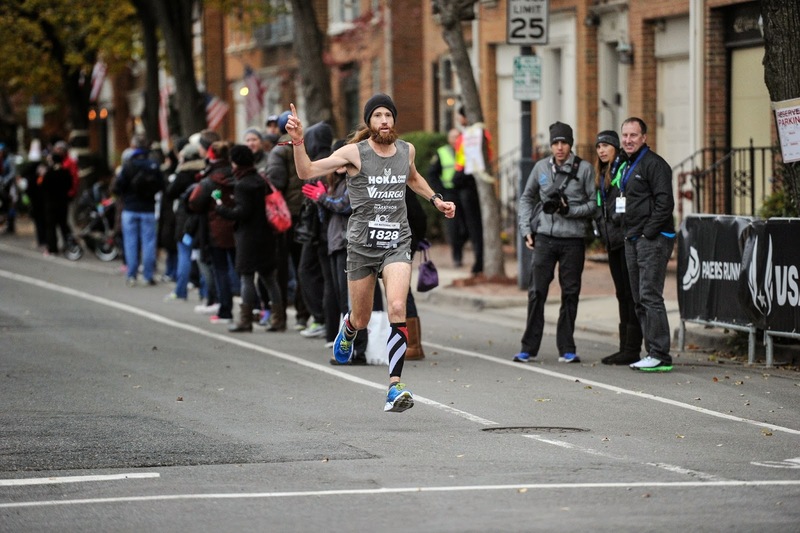 Wardian, running for Pacers/New Balance out of Arlington, Virginia and Rolly, running for the Baltimore Washington Athletic Club, out of McLean, Virginia ran tight through the first 5K, with neither runner gaining an edge, clocking 16:03. But reality began to set in shortly after that as Wardian steadily pulled away, creating a gap of 16 seconds by the 8K mark. Wardian built the lead steadily thereafter with the result that the pride of Arlington defeated the pride of McLean by 50 seconds, to take this prestigious national Masters title in 38:24. Wardian beat last year's winning time by 5 seconds. Rolly clocked in at 39:14. Frankie Adkins, from Asheville, North Carolina was, by contrast, in 'no man's land' for much of the race, between the two runner lead pack and the trailing pack. Adkins had a 3 second lead at the mile, but by the 5K had built that to 11 seconds, and by the 8K to 19 seconds.Patrick Kuhlman, of Washington, D.C., cut that by a second over the next two kilometers, but with the smell of the finish line in the air, Adkins found his second wind and sped in to claim the third spot on the podium in a time of 40:00 flat. Overall and F40. Jen Rhines, who was eligible to run in the Masters division for the first time, chose, instead, to run in the Elite division. That was all another local hero and defending champ, Perry Shoemaker, needed to know. Shoemaker sped to an early lead and was never headed as she displayed her increased fitness this year, running almost a minute and a half faster than her winning time last year. Her winning time of 42:54 gave her a winning margin of 3 and a half minutes. While Shoemaker was speeding to victory, Alexandra Bigelow of Asheville, North Carolina, was trying to claim her second consecutive second place finish. Last year, however, she did not have running legend, Joan Benoit Samuelson, to worry about. Bigelow established a seven second gap over Samuelson in the first mile but was unable to expand the gap. The lead was 8 seconds at the 8K and the 10K. With the finishing line approaching, Samuelson was closing the gap. But this time Samuelson ran out of race course before she could overtake the defending silver medaist, who claimed the second spot on the podium overall with 3 seconds to spare in 46:24. The 57 year old Samuelson took the third spot on the podium for the overall competition, an amazing accomplishment. And, by the way, in doing so, she broke the F55 age group record for the 12K. Third place in the age group went to Melissa Senall of Fairport, New York and the Genesee Valley Harriers, in 47:22. M45. Like the M40 group, the local Pacers/New Balance team also claimed first in this age division. Edmund Burke, of Silver Spring, Maryland, clocked the first mile in 5:23 and never looked back, sprinting to a winning margin of 30 seconds. The 9 second gap at the mile had increased to 18 by the 5K and 21 by the 8K, as Burke steadily built his final winning margin. His winning time was 40:35. Steve Kartalia of Westminster Maryland and the Baltimore Washington Athletic Club, was locked in a real battle with the pride of Worcester, Massachusetts, Francis Burdett. Kartalia trailed by 4 seconds at the mile but clawed that back to pull even at the 5K; he then made his move and between 5K and 8K established a thirteen second gap, which he was able to build on. In the end it was Kartalia in second in a time of 41:05 and Burdett third in 41:33. F45. 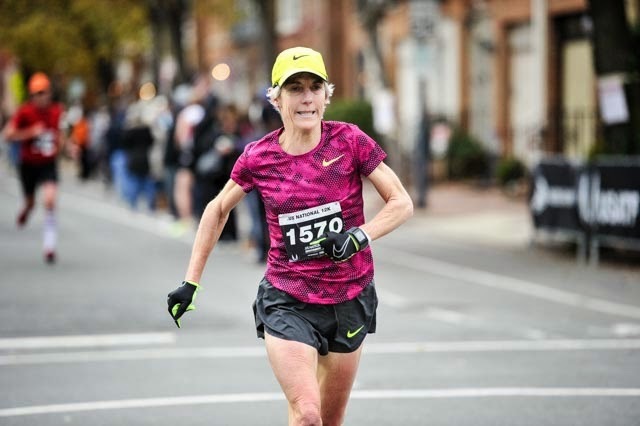 Alissa Harvey, running unattached out of Manassas, Virginia, sped ut to a 6:28 first mile, establishing a 22 second gap back to second; the gap did not shrink. In the end, Harvey took the crown in 47:47, a 6:25 pace per mile. Audra Naujokas-Knapp, of Rochester, New York and the Genesee Valley Harriers, claimed second in 51:08. Tina Klein of Kennesaw, Georgia and the Atlanta Track Club took third in 55:56. M50. This age division was quite competitive but not at the front. Eric Stuber of Playmakers Elite and Lansing, Michigan, ran 17:12 for the first 5K to establish a 13 second gap which he added to the rest of the way home. In the end, Stuber won in a time of 41:04. Ruben Henderson, also of Playmakers Elite, out of Grand Rapids, Michigan, threw down a first mile of 5:22 to stand in 4th place overall, but paid for it a bit over the next few kilometers, as Stuber passed him between miles 1 and 3. Nonetheless Henderson steadied himself and maintained his rhythm to take second in 42:37, displaying a 5:43 per mile pace. Jeff Haertl of Atlanta, Georgia and the Atlanta Track Club, ran a very steady race, clocking 5:47 for the first mile and finishing in 43:03 for a 5:46 per mile pace overall. That was good enough for a solid third place finish. F50. 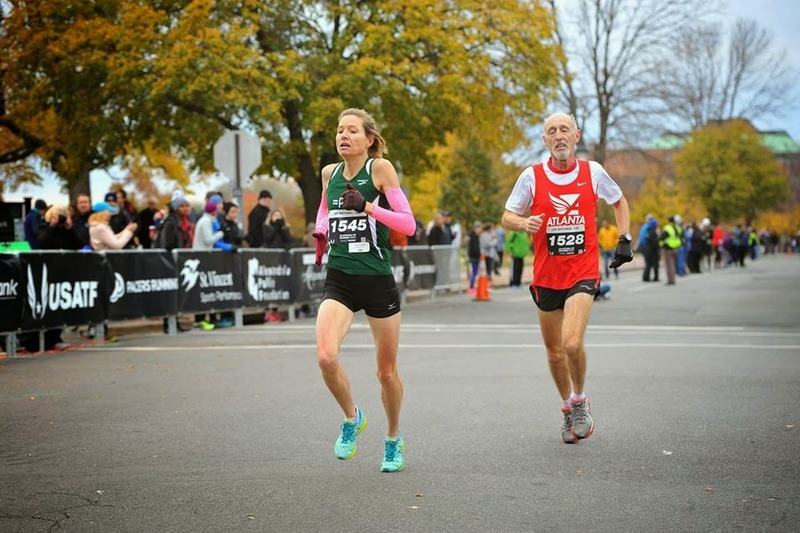 The Ann Arbor Track Club was well represented by Ann Arbor, Michigan native, Laurel Park, who ran a strong first 5K to establish a 14 second lead over Doreen McCoubrie of Malvern, Pennsylvania and the Athena Track Club. McCoubrie had run the first mile as if she were ten years younger, in 6:12, pretty impressive. But the day belonged to Park who came home first in 47:15, with McCoubrie a minute back in 48:16. McCoubrie's teammate, Julie Hankin, also of Malvern, PA. ran her own race, coming home third in 51:38. M55. This race belonged to the remarkable athlete from Tucker, Georgia, Ken Youngers, running for the Atlanta Track Club. Hitting the first mile in 5:39, Youngers pretty much maintained that pace and built his lead throughout the race, finishing in 42:46, another tour de force. Charlie Andrews of Rochester, NY and the Genesee Valley Harriers was not able to close on Youngers but ran a very strong race to finish second by a good margin in 43:14, averaging 5:48 per mile. 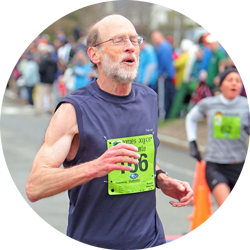 In this tough age group, Pete Gibson, of Murfreesboro, NC and the Colonial Roadrunners, found that it took a sub-6 minute pace to make the podium. Luckily Gibson was up to the challenge, finishing in 43:57 for a 5:54 pace and the third place medal. F55. Not surprisingly this age division was dominated by the legendary runner, Joan Benoit Samuelson, who took the 12K record in the process. For details of her race, see the description of the 'Overall and F40' division above. At the mile marker it looked like the race for second would be a real barn burner as Elizabeth Cooney of Somerville, Massachusetts, and Ida Draim, of Alexandria, Virginia, were separated by just one second. Thereafter, however, Cooney pulled away steadily to claim second place in a fine 52:29 time. And Draim needed to worry about a long-time rival, Suzanne Coffey, also of Alexandria, who was not far back. At the 5K mark, Draim was up by 9 seconds, but Coffey would not go away; she trailed by 7 seconds at the 8K mark. Then Coffey gamely made her move, taking the lead for the final podium position away from Draim, to lead by 6 seconds. But now it was Draim's chance to turn on the burners, which she did, overtaking Coffey in the last 2 kilometers to win by 8 seconds and claim the third spot on the podium. What a battle! M60. We have come to expect this division to be dominated by the lad from Mullingar, Ireland via Johnson City, Tennessee, Tom McCormack; no surprise. Not only did he win, he broke the record he established last year. Running with the top fifty-somethings, McCormack got clear of his rivals with a 5:41 first mile. That is even more amazing when one realizes he was just running slightly faster than a steady pace. He built on his huge lead througout the course, finishing in 42:55 (gun time) for a 5:46 per mile pace. This fleet, but modest, runner's chip time was 5 seconds faster, and that is what should count for the new record, 42:50. Rick Becker traveled across the country from Selah, Washington to contend and did not disappoint. Not many runners can keep McCormack in sight but Becker was up to the task for the first 5 kilometers. Becker was not daunted, however, when McCormack started to pull away, and kept his own strong rhythm, to finish second in 44:16, carrying a sub-6 minute pace for the entire race. Joseph Reda from DeForest, Wisconsin, made up the third member of the triumvirate, claiming third in 46:16. It was a pleasure to see the veteran runner from the Atlanta Track Club, Kirk Larson, back on the roads again after missing the summer and early fall. Not quite up to his usual fitness, he had to settle for fourth, but definitely on the road again! F60. It seems as if I am repeating myself. This age division also had a clear favorite, the astounding performer from Freeport, New York, Kathryn (Kathy) Martin. The defending champion and record holder, Martin again had an incredible race. She set off briskly to pass the mile marker in 6:29, just the pace she wanted. Unperturbed by other younger runners around her, Martin maintained a 6:32 pace to take the top spot and lower her record once again. Her chip time (which should count for the record) was 48:49 for a 6:32 overall pace. Coreen Steinbach, the bemedaled runner from Pompey, NY and the Athena Track Club, is typically the favorite if Martin is not around. She showed that again by taking second place, beating off the challenge from another strong runner, Sharon Moore, of Rochester, NY and the Genesee Valley Harriers. How does it happen that the three top runners in this division all hail from the Empire State?! Steinbach's lead was 4 seconds at the mile and at the 5K but then Steinbach found another gear and established an 18 second gap between 5K and 8K. She was able to build on that and finished second in 55:56. Moore came home in 56:38 to claim third. M65. Lloyd Hansen finished off his road racing year in fine fashion, taking another dominating win home with him to Salt Lake City. Hansen hit the one mile marker in 6:27 and never let up. To be honest, not only did he not let up, he accelerated after he hit the 5K mark. Averaging 4:01 per kilometer for the first 5K, Hansen was a second per K under 4:00 pace at the 8K, 7 seconds at the 10K and a whopping 24 seconds under at the finish. No split was taken at the half but if it had been, it would surely have shown a negative split. That strong finish led to a victory in 47:36. Four national road championships entered this year and four victories. Couple that with two national cross country titles and a couple of titles on the track and you have an awesome year. 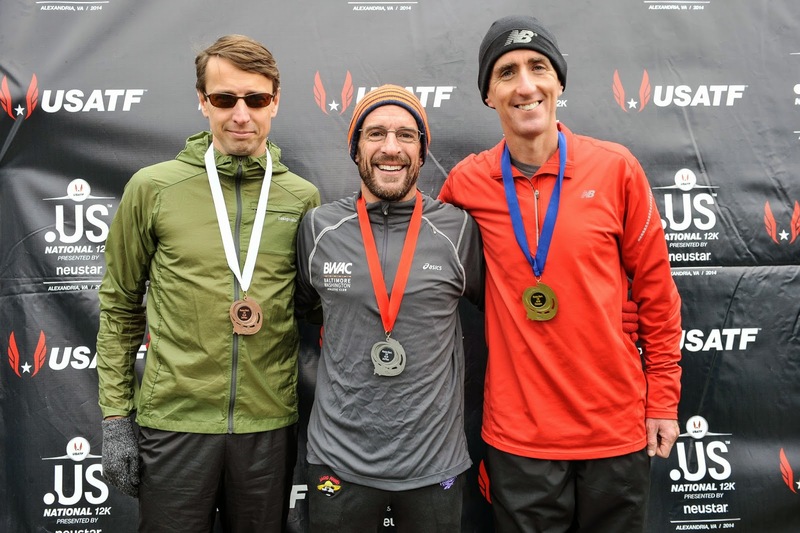 Two stalwarts of the road racing scene, one for the Genesee Valley Harriers and the other for the Atlanta Track Club, battled it out for second and third. Jim May, from Williamson, New York and Jerry Learned, from Gainesville, Georgia locked horns with Learned gaining the early edge, up by 6 seconds at the mile and by 5 seconds at the 5K. But Learned is coming back from a hamstring injury and was not able to maintain the kind of pace he was aiming for. May made his move between 5K and 8K, turning a 5 second deficit into an 8 second advantage. He was able to build that lead over the final 4K to take second place in 51:43; Learned finished in third 25 seconds back. So Jim May made the podium for the second consecutive week. Learned pulled his hamstring a few days before the 5K road championships at Syracuse, gamely ran that race but probably set himself back a bit. In any case this is his first race back and he was not quite up to his former fitness; he ran almost two minutes slower than his 2013 time. F65. Alice Franks of Rockville, Maryland, was the class of this division, taking the title by over ten minutes, in 57:04. Kathleen Doswell took second in 69:10, with Sandra Timmons, of Alexandria, Virginia ten minutes back in third place. M70. Another race, another record. The 'Silver Bullet' from Milford, Michigan, Doug Goodhue started out as if it was just another day at the office, hitting the mile mark in 6:29. The trick is that he forgot to slow down. 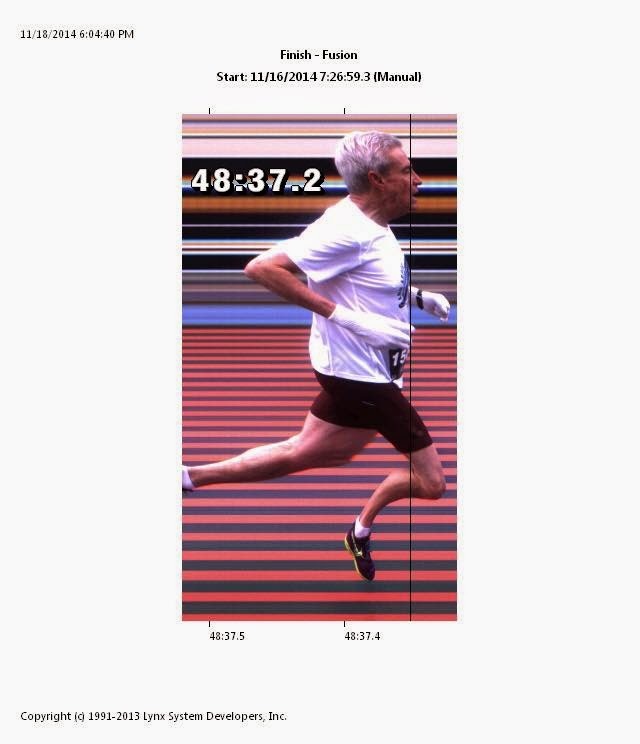 He eventually hit the tape in 48:38 (gun time), with a chip time of 48:33 for an overall pace of 6:31 per mile and a new record for runners 70 years of age and over. Pretty amazing stuff! Przemyslaw Nowicki, of Holmdel, NJ and the Shore Athletic Club and Monte Piliawsky of Ann Arbor, Michigan running for the Ann Arbor TC are two outstanding veterans whose minds were on the team race but also tangled for second and third individually. They both hit the mile mark at 7:29 and were still dead even at the 5K mark. But Nowicki was able to hold that early pace for another 3K, building a 14 second gap by the 8K mark. Nowicki took the second place with a final time of 55:50, leaving third place to Piliawsky in 56:11. F70. Just like the F60 division belonged to New York, this division belonged to Michigan and to the Playmakers Racing Elite team. Ruth Thelen from Saint Johns, Michigan led her Playmakers Racing Elite team home in 67:05. She was followed in by Ellen Nitz with a time of 76:18 in 2nd place and by Janet Wallen in third place at 81:00 flat. Clear cut results and very gratifying for the ladies from Playmakers Elite. F75. Heide Moebius, of Lancaster, Pennsylvania, had this division to herself so she raced folks in the younger age divisions and beat a number of them.. She took the crown in 65:01; at the age of 76 she was the oldest runner and the oldest national champion! Three cheers for this exceptional runner! Team Races. Although the team races are not quite as central to road races as they are to Cross country, they are important and this is one of the races that contributes , potentially, to the USATF Club Grand Prix. Unlike in Cross Country, all age divisions are scored the same way. Teams are placed according to the lowest accumulated time of the team's first three runners to finish. Women. Only one of the age divisions, the F60+ group,was contested by more than one team. But that was not a tight race. Even with the ace, Janet Thelen, aged 70, dropping down to run in the F60+ class, the Playmakers Elite team from Michigan did not have the horses to hold off the Genesee Valley Harriers from upstate New York. All three of GVH's scoring runners, Sharon Moore, Cindy Ingalls, and Jeanne Herrick crossed the finish line ahead of Playmakers Elite's first runner. Genesse Valley was able to win this one in a total team time of 1:00:04. Playmakers Elite was able to finish within six minutes of GVH because they ran with a pretty tight pack (Lynn Driver, Jean Bolley, and Ruth Thelen) even though they did not quite have the speed to match Genesee. The F40+ division was also won by GVH. Their team of Melissa Senall, Audra Naujokas-Knapp, and Linda Grossman blazed home in a time of 2:32:21. Playmakers Elite, in addition to their second in the F60+, took home the victory in the F70+ division. 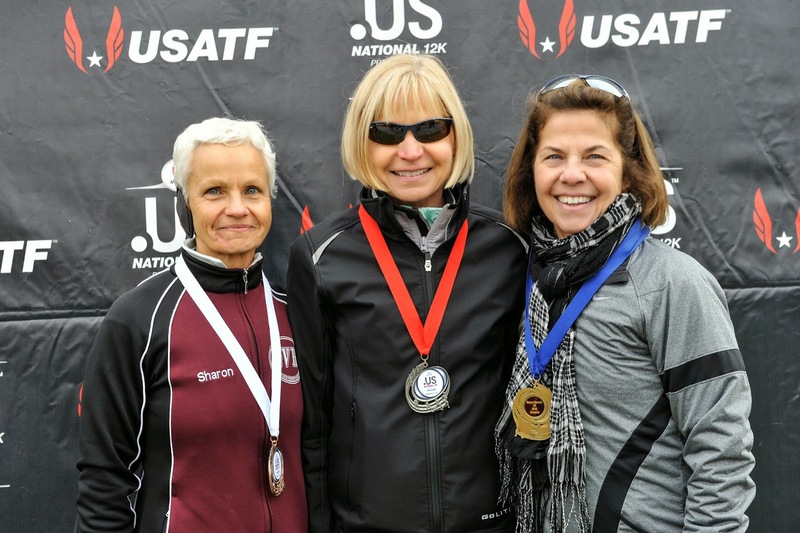 Even without Ruth Thelen, who opted to run on the Playmakers' F60+ team, Playmakers (Ellen Nitz, Janet Wallen, and Shirley Larsen) had an impressive win, with a time of 3:58:22. Finally the F50+ first place medal was claimed by the Athena Track Club of Pennsylvania. The scoring trio of Doreen McCoubrie, Julie Hankin, and Betsy Stewart sped to a 2:33:15 winning time, not even a minute slower than the winning F40+ team, a fleet team indeed. Men. All of the age divisions on the men's side were fully contested. M40+. In the M40 division, it was three local clubs who scored their first, and presumably, last points in the Club Grand Prix competition.The Baltimore Washington Track Club was the class of this field with their three scoring runners caiming the first three spots in this division's team competition. The total time for Phillippe Rolly, Steve Kartalia, and Conrad Orloff was 2:02:20 (40:47 average), strong enough for a 24 and a half minute victory. 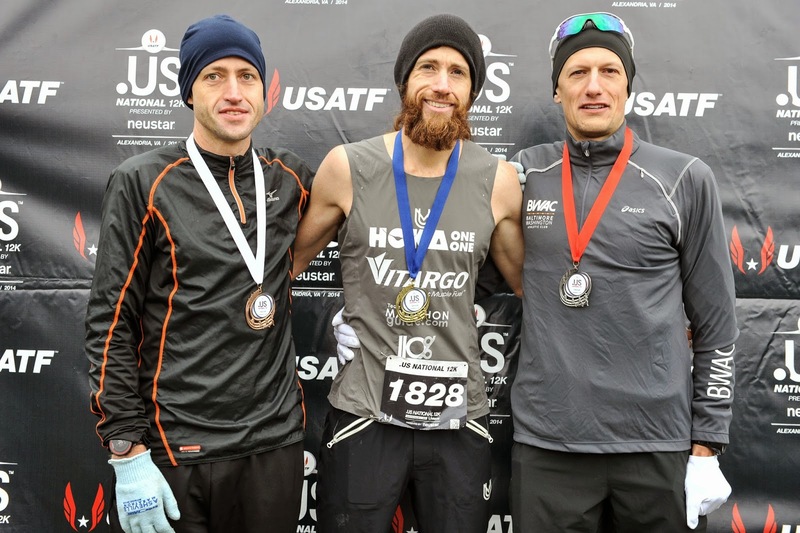 The race for second was a little bit tighter but the Potomac Valley Track Club's trio of James Cooper, Ted Poulos, and Mike Cannon took care of business in 2:26:52. And the D.C. Road Runners Club (Eric Winslow, Chris Johnston, and Doug Landau) followed them across the line in 2:33:39. M50+. This was the hottest team race of the day. The Playmakers Elite squad of Eric Stuber, Ruben Henderson, and J.D. Pepper fought off the Atlanta Track Club and the Genesee Valley Harriers by taking the first two spots with Stuber and Henderson and then relying on Pepper to beat or match the other team's 3rd runners, which he did. Even so, Playmakers' winning time of 2:07:50 (42:37 average) only led to a 3 minute victory. The race for 2nd was much, much tighter. The first two runners for Atlanta, Jeff Haertl and Vasan Neovakul, were in ahead of GVH's first runner but then had to wait for their third runner, Nathan Skipper. GVH had a tight pack and all three of their runners came in before Skipper. The team of Charlie Andrews, Joe Mora, and John Vankerkhove laid down the 43:44 time that Atlanta had to beat . Skipper had to finish under 45:23 to give Atlanta the second place finish. In the end, Skipper hit 45:13 to ice the win by ten seconds! Had he faded at all or lost focus at any point, GVH would have had the silver medal. But he ran tough for the team. M60+. The Atlanta Track Club took this one handily. Each of their runners beat their counterpart on every other team. The trio of Tom McCormack, Kirk Larson, and Jerry Learned hit a time of 2:23:31 (47:51 average) to take the crown by almost 14 minutes. Ann Arbor Track Club found themselves in the same position that Atlanta had been in the M40 contest. Their first two runners, Lloyd Hansen and John Tarkowski finished ahead of the first runners of the other contestants, Genesee Valley Harriers and the Shore Athletic Club of New Jersey. Then Ann Arbor, too, had to wait to see if their third runner, Mitch Garner, would collect a fast enough time to net the second place medal that could be theirs. [A note is in order; Garner is not usually Ann Arbor's third or even 4th runner-but Aaron Pratt and Wally Hayes were not running in this race. Ann Arbor is certainly well stocked with runners 60 years and up.] Jim May, Mitch Moore, and Gary Sterber finished in a tight pack to set a time of 2:38:22 for GVH. Spider Rossiter, 1st runner for the Shore AC, was able to edge May but the next two, Arthur Noland, and J.L. Seymore were not quite able to keep up with Moore and Sterber. Nonetheless, the Shore AC posted a time of 2:40:14. That would be enough for third place if Garner took too long. Garner needed 61:09 or better to get Ann Arbor the silver medal, and a time of 62:00 or better to nail down the 3rd place time. As the clock ticked past 58 minutes with Garner still on the course, his teammates might have been a little anxious. But not to worry, Garner got the job done and finished well enough to give Ann Arbor an overall time of 2:37:13 and the silver medal. Genesee Valley took the bronze. M70+. This division belongs to Doug Goodhue and the Ann Arbor Track Club. Each Ann Arbor runner beat his counterpart on the two other contenders, the Shore AC and the Clifton Road Runners. Doug Goodhue gave them an 8 minute cushion and Monte Piliawsky added another 4 minutes. By the time John Farah crossed the line to give them their third runner in, their cumulative time was 2:45:17 (55:06 average), a 17 and a half minute victory over Shore. In the race for second, Shore had the all important 1-2 punch of Przymeslaw Nowicki and John Nowatkowski. Even though their third runner, John Kuhi, trailed the third runner of Clifton, he hung tough and gave them the time needed to nail down 2nd place in 3:02:46. Clifton had a tight pack (Tom Pena, William Ash, and Matt Lalumia) and often that is enough, but not this time. Their total time was 3:08:46, a fine performance for the third place medal.